Maryann Daby was Tuesday arraigned on a charge of attempting to murder a police constable. She was refused bail and remanded to prison until May 23, 2018, despite claims of several loopholes in the case against the businesswoman. She is the daughter of Paul Daby Snr.who had been arrested several times in recent years for a number of offences police had suspected him of committing. 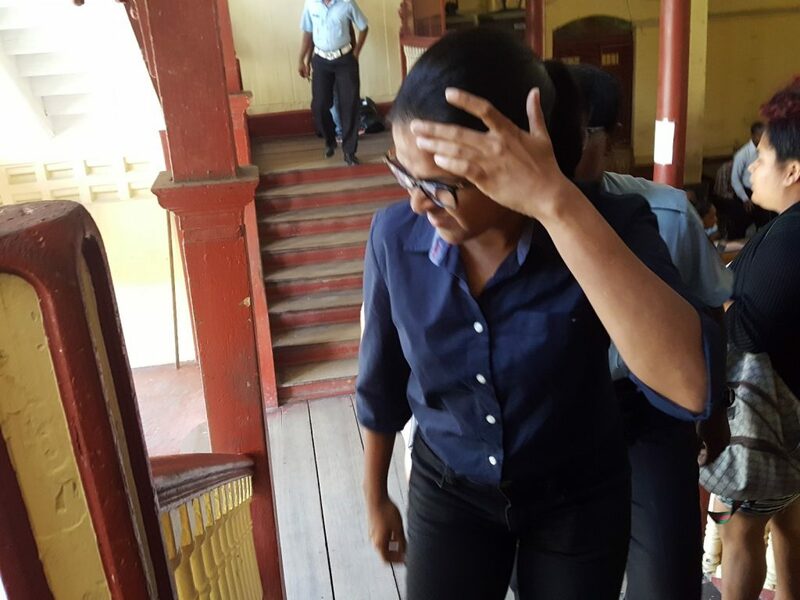 Principal Magistrate, Judy Latchman remanded the 25-year old woman to prison, after Defence Lawyer Mark Waldron cited several grounds for bail. Maryann is accused of attempted murder committed on Police Constable Christopher Kissoon on Sunday, May 13, 2018 on Albert Street and Thomas Road. Waldron cited the absence of any evidence including warheads, spent shells, gun residue results or independent eyewitnesses to support the Guyana police force’s case. He said 12 persons had gone to the Brickdam Police station to give statements that no such incident had occurred but none had been taken. Waldron also noted that the police did not obtain advice from the Police Legal Advisor or the Director of Public Prosecutions before charging Maryann Daby. “Those charges are grounded in malice and there is no evidential basis to support these allegations,” the lawyer said. The woman was also charged with being in possession of a .32 pistol and six live rounds without a valid licence being in force. To those charges, the lawyer argued that there is a grace period in each year during which persons could renew their firearm licences. He further noted that police had approved an upgrade to a 9MM pistol and she was still awaiting the arrival of the new firearm before surrendering the .32 pistol. The Police Prosecutor, in objecting to bail, told the court that the offence was “serious”. He said at the Guyana Motor Racing and Sports Club, shots were heard and on checking Davy was seen shooting in the air. When Constable Mission approached her, the prosecutor further alleged that she pointed the same firearm to his head and squeezed the trigger but the firearm did not go off.